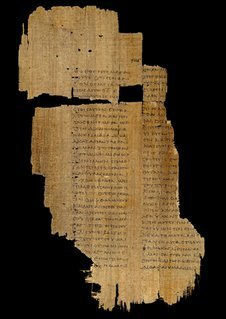 exhibitionists • In the Beginning :The Bible before 1000 a landmark exhibition presented in association with the Bodleian Library, University of Oxford, running October 21, 2006–January 7, at the Arthur M. Sackler Gallery at the Smithsonian Institution. inkstain • A Edinburgh Private school is insisting pupils use fountain pens, in an attempt to save the dying art of handwriting. They believes longhand is on the brink of extinction, thanks to text messaging and computers. NYP • Frank McCourt, Angela and the Baby Jesus, scheduled to come out in fall 2007 in children’s and adult editions. naughty naughty • The University of Tennessee Press has halted sales of the Civil War book Captain Henry Wirz and Andersonville Prison: A Reappraisal by adjunct history professor Fred Ruhlman following plagiarism claims by New Hampshire author William Marvel, who contends the book contains “uncredited material” and even repeats a bibliography mistake.